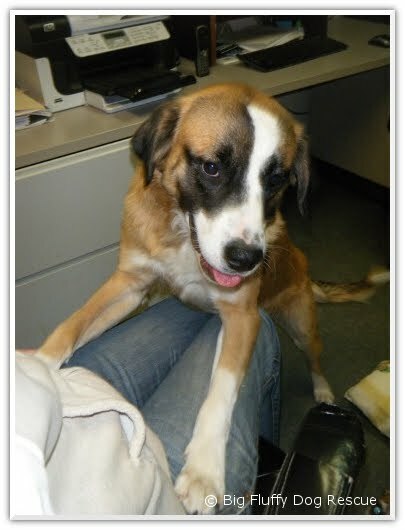 Today's entry in my Saturday "Adopt-a-dog-athon" for the Saturday Pet Blogger Hop is Wesley. Wesley was one of the dogs I helped bring up from North Carolina last weekend. Most of the transports were from a South Carolina shelter but Wesley hitched a ride from a high-kill shelter in NC. There appears to be some confusion over his age and breed but I'm going with the St. Bernard/Border Collie mix somewhere around 1 - 2 years old. Wesley is just a big goofball, very gentle and easy-going. He's great with kids and dogs, ok with cats. He was a perfect traveler in the car, no signs of anxiety. He's very playful but also likes to get his snuggle on. You can view Wesley's full profile at this link on Petfinder.com. He is available through Big Fluffy Dog rescue. Please visit their site for more information on the adoption process. And please, spread the word on Wes. Thank you. Hi Roo, I think you're right - Wesley is going to land in a great new home very soon. I sure hope so anyway! What a cutie patootie! Looks like he must have taken up a bit of room in your car. Playing catch up. Wesley is a handsome dude when right side up ;). You are doing a great thing for these dogs. Here in the very rural southeastern areas you can't drive a mile without seeing pathetic pups alongside the road scrounging for food. A dear friend who has a "life estate"...(you don't really own the property because it is in trust for heirs but you have the right to live there for your lifetime)...would pick up homeless pets and when the shelter was full she'd take them in. Needless to say the bank who oversees the property put a stop to her soft hearted attempts at rescue. You could probably drive the rural roads and fill a shelter in a day. The local shelter has been forced to become a kill shelter. Thanks for sharing the information about what's going on in your neck of the woods. The same thing is happening in Puerto Rico (my Bella's birthplace) and it's so tragic. We're working to change attitudes about spay/neuter programs there. I wonder if you think that could help down in your parts? Do you know if there are efforts to promote such and if they are, if you'd care to offer us an opinion as to whether or not you think they're working and why (or why not)? I believe we have to do what we can to help these dogs but I also know the problem will be never-ending if we don't address the source and was hoping you, or anyone else reading this thread btw, might have some thoughts on that part of the problem? Thanks a bunch for visiting and offering your insight. I love the spay neuter programs and with the barn cats have taken advantage of it to keep them all neutered. The reason for so many strays and un-neutered animals in rural areas, I believe, is the attitude of people toward their animals. Basically dogs and cats are not family members. Many feel, including some members of my own family, that furry things with paws should live outdoors, not in the house. Another attitude that I find strange is toward fencing. I've been told that fencing is unkind. Unkind??? You cannot talk to these people. Hey Hawk, Yeah, we see the same attitudes in Puerto Rico (there's even a 'macho' element there re: neutering, if you can believe that!) It has taken a long time and a lot of effort but attitudes there are changing - slowly. Hopefully if we just keep putting the message out, people will start to 'get' it.